Right now you are burning. Your body is busily oxidizing your last meal, converting it into new tissue, energy, and heat. This internal combustion is a 'slow burn', but the result is the same as a roaring bonfire: carbon compounds are combined with oxygen, breaking them down and producing thermal energy in the process. The greater the difference between the temperature inside and outside your body, the more rapidly you radiate this heat to the environment. The body temperature of most creatures — including insects, fishes, and reptiles — fluctuates with the temperature of their environment. This is known as 'ectothermy' or 'cold-bloodedness'. Because they cannot maintain a constant body temperature, cold-blooded creatures tend to live where the average environmental temperature is optimal for them. But birds and mammals are able to physiologically regulate their internal temperature within a narrow, optimal range. This is called 'endothermy' or 'warm-bloodedness'. Our warm-bloodedness has (in part) enabled our species to extend its range from the warm equatorial tropics where we evolved to the cold temperate zones of higher latitudes. In cold environments, we can use insulation to help maintain our bodies' internal temperatures. Water conducts heat many times faster than air, draining precious body heat with unrelenting efficiency. When diving, we rely on our dry or wet suits to insulate us against heat loss by trapping a layer of warm air or water against our skin. If we venture into a cold aquatic environment without such insulation, our internal thermostats need to work overtime to prevent hypothermia. I'm sure you will agree it is much easier (and more comfortable!) to swim in warm water than to warm cold water with your body heat. Many types of marine animal — including most sharks — are ectothermic, and thus are most abundant in warm waters. But at least seven species of mackerel sharks — the Great White (Carcharodon carcharias), the Longfin (Isurus paucus) and Shortfin (Isurus oxyrinchus) makos, the Porbeagle (Lamna nasus) and Salmon Shark (Lamna ditropis), the Common Thresher (Alopias vulpinus) and the Bigeye Thresher (Alopias superciliosus) — have successfully invaded cold waters. These sharks are unique in their ability to elevate and maintain body temperatures as much as 13 °C above the ambient water temperature. One striking feature of these warm-bodied sharks is that their flanks and viscera are warm, while the heart and gills are at environmental temperatures. This is because they differ substantially from all other sharks in the pattern of blood supply to the viscera and swimming muscles. The warm-bodied mackerel sharks have a special organ in their circulatory systems, allowing them to retain much of the heat generated by swimming and muscular activity. In cold-bodied sharks, this heat is radiated from the body surface and lost to the environment. Warm-bodied sharks are able to greatly reduce this heat loss by redirecting blood from enlarged arteries along the flanks inward through a dense bundle of small arteries and veins called the rete mirable (or "wonderful net"). The arteries in each rete carry cold, oxygenated blood from the gills, while the veins carry metabolically-warmed, deoxygenated blood. These small arteries and veins pass very close to one another, carrying blood in opposite directions. Because of this intimate countercurrent blood flow, most of the heat is transferred from the veins to the arteries and cycled back to the muscles and visceral organs that produced it originally. The warm-bodied mackerel sharks have three sets of retia: one in the swimming muscles, another in the anterior viscera, and a third surrounding the brain. Mackerel sharks with this modified circulatory system are able to maintain body temperatures well above that of the water in which they swim. The advantages of being warm-bodied are stupendous. A 10 °C rise in body temperature can result in a three-fold increase in the speed and strength of muscle contraction — providing more power from a given muscle mass. For mackerel sharks, this may afford an increase in sustained swimming speeds. Greater speeds may be selectively advantageous when chasing prey or fleeing from predators (although it is difficult to imagine anything — other than man — regularly preying on even moderately large mackerel sharks) Being warm-bodied might also allow mackerel sharks to make excursions into colder or deeper waters. To remain alert in the mind-numbing chill, mackerel sharks have a rete 'brain heater' to help stave off the grogginess brought on by their cold-water environment. Theoretically, conservation of body heat may allow a more complete conversion of heat energy to work — or, to put it informally, more miles-per-fish. Elevated visceral temperatures — which are highest in the intestinal valve — may increase the rate of digestion and absorption of food, making available more caloric energy per day. The visceral retia also warm the uteri. By holding their young in warm uteri, mackerel sharks may somehow enhance the development of their embryos. Perhaps this shortens gestation, increasing the number of pregnancies a warm-bodied shark may have over her lifetime. Unfortunately, we know so little about development in these sharks that their gestation periods cannot be compared with those of cold-bodied sharks. But the advantages of endothermy are costly. To maintain a warm body in cold water, a mackerel shark must burn fuel like a blast furnace. A warm-bodied shark may need more than ten times as much food as a cold-bodied shark of the same size. The thin biomass of tropical seas cannot readily support such high-energy carnivores. Since large fishes and large, energy-rich marine mammals tend to live inshore in cold temperate waters, mackerel sharks are most abundant in these areas. The distribution of warm-bodied sharks is thus dictated largely by availability of prey. For example, the Great White Shark is undeniably one of the sea's paramount predators: it can — and does — feed on virtually anything that swims. 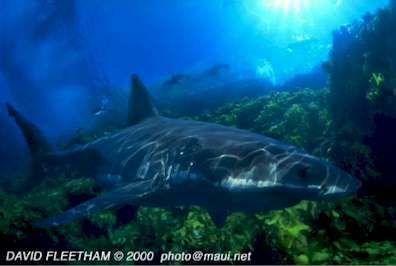 Adult White Sharks feed heavily upon seals and sea lions, which are large, swift, and agile. Most pinniped rookeries (large breeding colonies) are in cold temperate or sub-polar regions, and the white shark rarely strays far from these important food sources. Although the White Shark (Carcharodon carcharias) regularly visits warm and even tropical waters, it is primarily an inhabitant of cool temperate seas. Its ability to exploit the rich feeding in these productively rich waters is made possible by a combination of a specialized heat-retaining circulation and sheer bodily bulk. Photo © David Fleetham david@davidfleetham.com; used with the gracious permission of the photographer. While energetically expensive, endothermy has enabled the mackerel sharks to function as effective predators in cold waters, taking advantage of the rich feeding available there. In the North Atlantic, Shortfin Makos pursue high-speed ocean rovers, such as bluefish and swordfish. The Salmon Shark is an endurance predator, picking off Pacific salmon as they migrate along the coasts of Alaska and northern Japan. The Bigeye Thresher swims deep in cold water, scanning the surface for the silhouette of schooling baitfish with its huge, upward-mounted eyes. The combination of large size, efficient metabolism, high-speed swimming, and powerful jaws help make the mackerel sharks versatile predators, allowing them to feed on a broad spectrum of prey types. By extending their range into cold waters, these sharks avoid competition with their cold-bodied cousins, which must remain in warmer seas. No doubt the heat-retaining retia of the mackerel sharks have freed them from being captives of the isotherms — allowing them to range throughout the breadth and depths of the World Ocean. For many people, sharks are the epitome of the 'cold-blooded killer'. The warm-bodied mackerel sharks are spectacular reminders that many of our stereotypes are inaccurate. As apex predators, sharks are absolutely essential to the health and vigor of marine ecosystems. But their future in our oceans is very tenuous: we are slaughtering them for food and sport in unprecedented numbers. Perhaps a greater appreciation of the elegant adaptations of these incredible animals will help us see their intrinsic value. Our world would be a poorer, darker, lonelier place without them. Why do Most Sharks Live in Salt Water? Without Bones, How Do Sharks Make Red Blood Cells? Does Liver Size Limit Shark Body Size?